​​Welcome to the DMACC Chemistry Department website. For information about chemical safety for specific labs, click the following link - chemical safety information. Chandana joined DMACC in 2011 summer and since then has been teaching all levels of chemistry classes at the Ankeny campus as a regular and an honors faculty member. In addition to his teaching duties, he is also serving as the REU coordinator and the STEM club advisor at the Ankeny DMACC campus and a team member of the DMACC - IINSPIRE LSAMP (The Iowa Illinois Nebraska STEM Partnership for Innovation in Research and Education – Louis Stokes Alliance for Minority Participation) team. He also serves as the faculty leader of the chemistry blackboard community at DMACC. Chandana got his first degree, (B.Sc. Honors Degree in Chemistry and Mathematics) in 1998 from the University of Peradeniya, Sri Lanka. Soon after completing his B.Sc., he joined the Open University of Sri Lanka as a Chemistry Instructor and worked there for a little over two years before joining the Department of Chemistry, The University of Arizona to read for his Ph.D. in the year 2000. 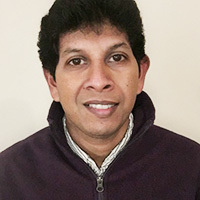 Immediately after finishing his Ph.D., Chandana joined the Department of Chemistry, Purdue University, Indiana as a Postdoctoral Research Assistant and worked for one year before moving to the University of Iowa as a Postdoctoral Researcher in the year 2008. While doing his research in the fields of Microwave / Laser Spectroscopy and Atomic Force Microscopy over the years, he has taught several undergraduate chemistry classes at these institutions. Chandana primarily teaches the Introductions to Chemistry (CHM122) and General Chemistry I & II (CHM165 & 175) face-to-face and web-blended classes at the Ankeny Campus. 1. Chandana Karunatilaka, Dejan K. Bučar, Lindsay. R. Ditzler, Tomislov Friščić, Dale C. Swenson, Leonard. R.
single-crystal transformation", Angew. Chem. Int. Ed. (2011), 50, 1 – 6. An Electric Discharge Source", The Journal of Physical Chemistry Letters, (2010), 1, 1547–1551. Chemical Society (2007), 129(34), 10522-10530.
measurements of Bis(cyclopentadienyl)tungstendihydride, (C5H5)2WH2" Organometallics, (2007), 26, 2070-2076.